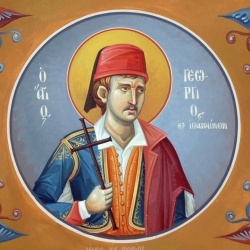 The New Martyr George of Ioannina was a young Christian who maintained his Christian beliefs while laboring for Ottoman Turks who considered him an apostate from Islam, which led to his martyrdom. He is commemorated on January 17. George was born in 1808 in the village Tsourchli in what is now Grevena Prefecture, Greece, the son of a poor farmer Constantine and his wife Vasilo. Orphaned at a young age and without any formal education, George moved to Ioannina and became a servant of the Turks, employed in the Turkish army as a horse groom and stable hand under the name "Infidel (Giaour) Hasan". Modest in demeanor, George wore the traditional long foustanela of his village and an embroidered waistcoat, as now depicted on his icons. George entered into a new phase in his life as he became engaged to and then married to Eleni, a Christian girl from Ioannina, on the feast day of St. Demetrius. In December 1837, the couple had a son, John who they had baptized according to the Orthodox tradition on January 7, 1838. These events aroused the suspicion of the Islamic Turks and provoked his persecution as the Turks had considered him a muslim Turk who was abandoning Islam. George refused to deny his Christian faith and he was subjected to torture by the Turk. During the tortures he courageously maintained, "I was never a Turk, I was always a Christian". Sentenced to the gallows, George steadfastly defended his faith. Facing the gallows with composure and bravery, George answered his tormentors' final question to him "What are you?". After he had asked that his hands be untied, he made the sign of the cross and replied, "I am a Christian and I shall die a Christian, I bow before my Christ and my Lady Theotokos.” His martyrdom occurred on January 17, 1838. His body was left to hang from the gallows for three days. When taken down, his body was found not having begun decaying, which caused even many Turks to believe in his holiness and allowed George's body to be buried honorably. The people began to honor George as a saint even as he was being tortured, and soon after his death asked for formal recognition of George as a saint from the Ecumenical Patriarchate. George of Ioannina, the New Martyr, was officially glorified on September 19, 1839 by the Holy Synod of the Patriarchate of Constantinople. To make his sainthood less obvious to the Turks, the Synod, at the time, asked that it be celebrated on January 17, with St. Anthony. The first icon to the newly martyred saint was made on January 30, 1838, only days after his martyrdom. It was commissioned by the Hieromonk Chrysanthos Lainos who was George's spiritual father and guide and depicted St. George in his traditional clothes, holding a cross in his right hand and a scroll in his left. This page was last edited on August 11, 2014, at 02:42.